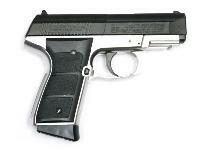 Daisy's Powerline 5501 CO2 BB pistol shoots 15 shots as fast as you can pull the trigger. Real blowback action! Load the 15-shot clip, drop in a 12-gram CO2 cylinder and send that ammo downrange. 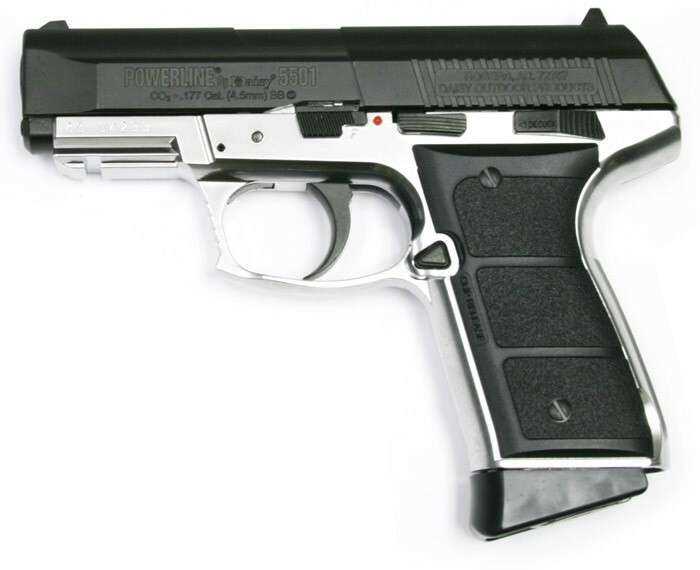 You'll get hours of plinking fun out of this little pistol. Never shoot BBs at hard objects. Click the Ammo link to stock up on BBs. Check the Accessories link for CO2 cartridges, targets and safety gear. 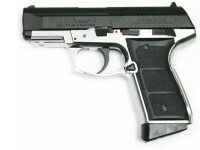 Things I liked: Hi all my airguns have all been pretty much bought from pyramid who is the best .I bought this pistol at our local gun shop and fell in love with it.I had to look at the reviews to see if other poeple were having the only problem....The cheap clips..The only consistent complaint..I will order a couple more for 20$ worth it.The one that came with my pistols spring broke and I replaced from another clip that fit but has occasionally made the gun malfunction..So the clips must b purchased for this well made fantastic pistol.And my favorite safety feature is that fantastic decoder.Very safe very powerful accurate reliable..CLIPS!! only bad thing..I will treat my new ones like fragile eggs.lol. Things I liked: I've found through the years you never can go wrong with the value of a Daisy Power line product. What others should know: Great entry level trainer and fun short range target shooter. Things I liked: Gets about 50 to 60 shots per CO2 cylinder, Accurate up to about 35 ft, weight feels good. Great gun for the price. Very well made, great quality. Things I would have changed: Metal clip. 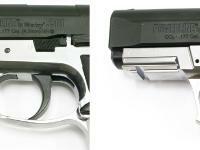 What others should know: I mounted a Gamo laser sight on the rail in front of the trigger guard. Awesome addition. Any attachment I can get to put a barrel extension? Or maybe a 1 piece extension? The gun does have a 7/8" Weaver rail on the front under the barrel. It should fit.